Nintendo historically has not been known for its support of the independent development community. Indeed, consoles in general are not typically an indie's first choice, as most typically choose between mobile (iOS and Android) and PC (usually Steam), but with Xbox Live and particularly PlayStation Network making strides to support indies the winds of change seem to be blowing in Nintendo's direction too. With the Switch having just launched last Friday, Nintendo held a special "Nindies" event during GDC 17 last week to showcase its support for the indie community. GamesIndustry.biz was there to speak with Damon Baker, head of publisher & developer relations, as well as several indies who were demoing their titles. While Nintendo was clearly making overtures to the indie community during its Wii U days, Baker said the outreach started much earlier. "We have been working with indie developers and publishers for a really long time, back to the Wii days... I think with every console generation we're always looking for new ways of showcasing the fun of that system and what's awesome about the indie developers is that they're willing to take risks. They create edgy content, they [offer] a really cool, unique perspective on how they utilize the technology of the system as well," he said. "What we've got here is we've identified a bunch of those developers that we think taps into what resonates really well with the Nintendo audience in particular and showcasing why that content fits so well on Nintendo Switch specifically." It's no secret that Nintendo's Switch launch lineup is fairly sparse, so having an array of content from indies should prove very useful in bolstering the Switch portfolio. Baker said he was part of a team that was formed around eight months ago specifically to focus on content curation for both 3DS and Switch. "I feel like it's important to respect and honor Nintendo fans by procuring original content and unique experiences from the start so we can set that high bar," he said. "If it's on Steam, then there's no reason why it shouldn't be on Nintendo Switch as well"
Nintendo has gone out of its way to target relationships not only with individuals but with key indie publishers, like Team 17, Chucklefish, Raw Fury, Devolver, and Double Fine. All told there are over 60 titles confirmed already, and there are even exclusives or titles that are coming to Switch first. That being said, Baker stressed that he's not competing with other platforms for indies' attention. "The way we're looking at Switch is this is a complementary platform. If it's on Steam, then there's no reason why it shouldn't be on Nintendo Switch as well," he remarked. "If you want to take that experience on the go, if you want to have a baked in multiplayer experience, this is the system to do it. It's got those points of differentiation, but we're not trying to go head-to-head against any of the other platforms. We just think that if the content makes sense to be over on our platform then it should be on our platform. "We're just trying to evangelize what that unique perspective is for Nintendo Switch and what unique opportunities are available for it, and also to continue to look forward. There's a lot of fans, a lot of developers that have made content in the past and believe that it deserves to be on Nintendo Switch and maybe it will be eventually but we feel we have a responsibility to honor our fans and give them new and original experiences, and make sure they're really excited every time they come to the Nintendo eShop to see what's new." With that in mind, release cadence will be critical. Baker said that they learned from the mistakes of the Wii U, and certainly those 60 confirmed titles won't be hitting the eShop all at once. Staggering releases will not only keep things fresh, but it should aid developers with discoverability on Nintendo's digital storefront. "We haven't opened the floodgates yet," Baker said. "We are just really taking an approach with the launch window to make sure the content really resonates with fans. We're not saying no to content that only uses the touchscreen or doesn't use the Joy-Con in a unique way, but at the same time we're trying to encourage those developers and have a conversation with them and say, 'Look, fans are probably expecting these types of fun features and functionality in the game' so maybe they should consider them and take a look at what it would take to implement that technology into the game if it makes sense for that type of experience." "I think it's definitely a platform that pretty much any indie is going to want us to target"
Nintendo wants to make developing for Switch as easy as possible. To that end, Switch has proper Unity and Unreal support from day one and Baker said that dev kits are "quite affordable." The whole certification process is a lot easier now as well. "We're still encouraging self-publishing. Right now what we're doing is we're accepting pitches from all of our publisher and developer friends - anybody that's interested in bringing content we encourage them to reach out to us so we can evaluate that," Baker continued. "If they're granted access into the developer portal and given the tools to develop on Nintendo Switch then they still have the opportunity to release whenever they want, they have the opportunity to price the content whatever they want. We just have that open dialogue with them and try and work on our release strategy so that we can get behind it with marketing and promotional support and make sure they aren't going to get lost in the noise of everything else that's going on." Baker wouldn't be doing his job if he didn't evangelize the Switch platform for Nintendo, but the indies that I spoke to during the event were practically giddy with excitement over the chance to be a meaningful part of the early Switch lineup. Brjann Sigurgeirsson, CEO of Image & Form Games, who was on hand to demo SteamWorld Dig 2, commented, "We've been treated like royalty. And I would be saying that even if we weren't sitting in this room. We've always felt special [with Nintendo]. If you can make everyone feel special you're definitely doing something right. You're not treating an indie like something you can afford to miss out on - if you treat an indie studio like the way you'd treat a bigger studio or publisher that indie studio is going to love you and do stuff for you forever. And that's exactly the feeling we've had with Nintendo the whole time. 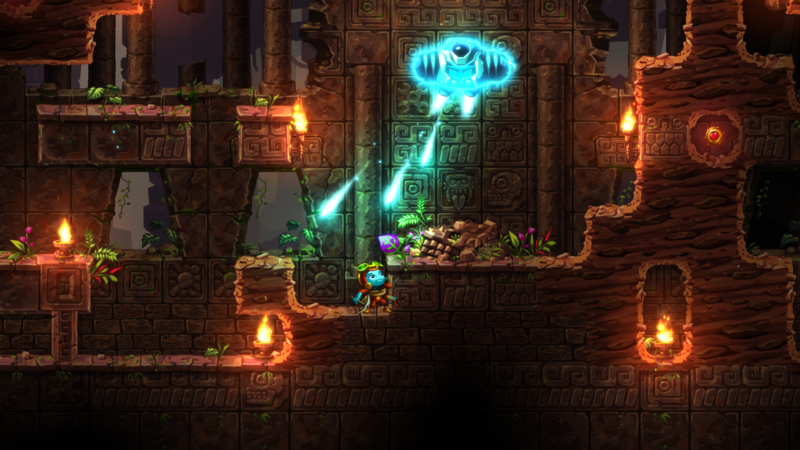 "We released SteamWorld Dig, the original on the 3DS in 2013, and we've never looked back. It's never been a question of what platform we would support first. They inspire loyalty in you by treating you very, very nicely." David Dino, a designer at Sumo Digital, which is bringing Snake Pass to Switch, agreed: "When you look at all the [indie games at this event] they almost chronicle the type of genres that have made gaming in general and I think Nintendo understands what the indies can do to bring [a variety of content] to the Switch. They've been very welcoming and almost hand-holding through whatever process we need to get our games on the platform." Carl-Henrik Skarstedt of Yacht Club Games (Shovel Knight: Spectre of Torment) chimed in: "It's been great. They've been really supportive of us while at the same time trying to get their hardware out... If you're just starting out making games it might be hard, but once you have something great to show, as soon as Nintendo's ready for it I think it might be easier to get in touch with each other and start a dialogue about publishing on their machine." Zoink CEO and creative director Klaus Lyngeled, who was showing off Flipping Death (and is also working on Fe under the EA Originals program) agreed with his colleagues that Nintendo is easier to deal with nowadays. "I also did Wii titles, and back from the Wii days it's very different. They are much more approachable, they are much more interested in you, it's easier for us to get a kit, and... it's become a lot easier for us to actually publish something on the eShop," he noted. "I feel like there are a lot of indies who are really interested in Switch now. They really are pushing for it and they want to have a new platform to release something on." Luke Burtis, co-founder of indie publisher Tiny Build, has his finger on the pulse of the indie movement and he's noticed that Nintendo's "definitely progressing in that area" too. "Before they've kind of been a lot more closed off, and with the Switch it seems like they are opening up a lot more. They are obviously taking a cautionary step - they are only working with a couple handfuls of indies initially to see how the reception is from the consumer base, but I think it's a great first step. 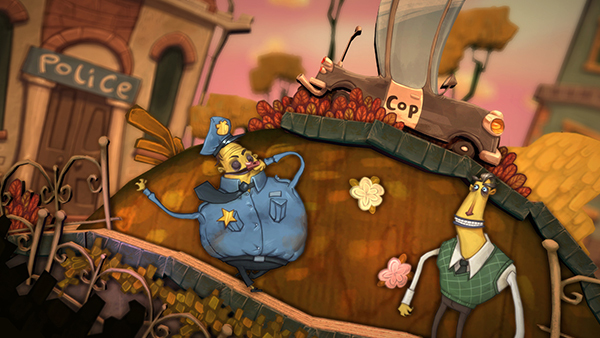 We have Mr Shifty coming out in April and we'll have a few other games coming out later in the year," he said. We asked Burtis how often he hears from indies who want to pursue Switch. "Nowadays? Pretty bloody often. Beforehand, not so much - I think as more information came out about the platform it got a lot more people excited. Every single dev for games that we now have coming out are like, 'Hey can we also be on the Switch?'... But I think it's definitely a platform that pretty much any indie is going to want us to target. "Definitely discoverability from our standpoint is one of the biggest things. It's going to be curated for quite a while, so if you can get on there you should be pretty golden. I also think that being able to take such polished games...with you on the go [is amazing]," he added. The developers I spoke to were in consensus about the problems inherent in the mobile market and Steam. That's partially why they're so happy to have another platform to flock to. "I'll want it to be curated somehow because I don't want to be stuck - that's the problem with Steam right now because I feel like I'm just shovelware. It doesn't matter if there are so many users on Steam, because if you can't reach any of them with all the noise [in the marketplace] it doesn't matter. It's much better to get out on a platform where you can be seen," explained Lyngeled. Sigurgeirsson added, "There was a time when Steam wasn't so cluttered, meaning that if you as an indie could get your game onto Steam you'd be set. It's really not that indie friendly on Steam any more; it's not even publisher friendly. It's started to resemble the App Store in a way - you have so many titles that almost by definition it's not indie friendly. On the App Store you have a hundred new games coming out everyday - maybe there are a hundred games coming out to the Switch in a year. You're almost guaranteed so much more visibility." While Nintendo hasn't been attempting to compete in the horsepower department for a few hardware generations now, the Switch is no slouch - and when combined with proper tools integration from the outset, it's got more than enough juice to enable most indie developers to fulfill their creative visions. "It's powerful and really easy to develop for. There's not very much wrong with the system"
"When we tried to do Zombie Vikings for Wii U - when I got Unity I could see it just wasn't going to work, it was too slow an engine; then we got Unity for Switch and we saw directly, 'wow it's actually working' and the tools are much better. So that part is very important for most indies," Lyngeled said. "Most indies are using Unity and that makes a huge difference. It feels like they are pushing Unity more to make it good from the beginning." Sigurgeirsson has been impressed with the hardware too. "We've made games for the 3DS, the DSi, for the Wii U and they all had some issues - the 3DS and DSi were just weak," he said. "Since we were developing for them specifically it wasn't like we were watering down our games, but all the time through development we had to think about how not to overtax the system. With the Wii U there was more power but you had the gamepad where you could use the [screen] and TV at the same time and so you had to show different things and take that into consideration. "This is straightforward, period. What you see on the big screen is what you're going to see on the handheld as well. It's very simple and powerful, and ingenious - it's a home console and a portable unit. Everybody's wanted to say that in the past but here it is now. It's powerful and really easy to develop for. There's not very much wrong with the system." As I walked around the room, I couldn't help but think about the PlayStation Vita. In many ways, the Switch titles being shown would be perfect for what was likely Sony's last ever dedicated portable gaming system. The Vita had become an indie darling of sorts too, but with Nintendo it's unclear what the future holds. Will Switch effectively replace 3DS? Nintendo, of course, isn't saying that, but from an indie perspective that could be what happens. "I do know that a lot of people were thinking about 3DS and now they are thinking they are just going to do the Switch for now and see how that works out," Burtis confirmed. Early indicators for the Switch launch are hugely positive, as the system has already beaten Wii launch weekend records. If the Switch manages to succeed on a level even close to that of the Wii, indie developers should be very happy with the audience they can target. But as that ecosystem grows, it will be incumbent upon Nintendo to manage the eShop effectively. Finding a careful balance between curation and making the platform accessible to a large number of indies will be key.